Ijen Crater Tour, Mt Bromo, Madakaripura Waterfall Tour 4 Days is combination trip of Mount Bromo Trip 4 Days 3 Nights. This trip start from Surabaya, Malang or possible from Banyuwangi. 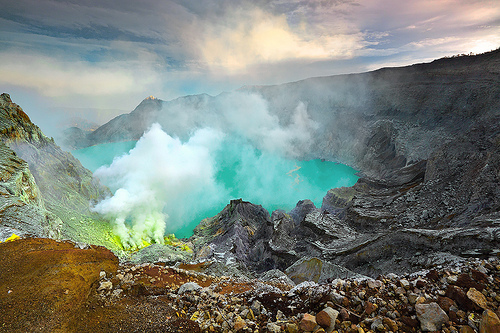 Ijen Crater, Bromo, Madakaripura Waterfall Trip is one of the most ordered travel package to explore the most popular nature tourism package in East Java Indonesia have always visited by domestic and foreign visitors. If You are interested to enjoy these places, You must start from Surabaya or Malang in the morning or You can start from Bali or Banyuwangi. Our driver wiill pick you up using private AC (air conditioned) Car or Van and take you to your hotel around Ijen Crater area for 7 hours driving, Check in and Stay 1 night around Ijen volcano. Reach Ijen volcano rim, enjoy the views for Sulfur miners loading sulfur from bottom of Ijen crater, Green Acid Lake and yellowish sulfur). If You able begin from the hotel around Ijen, You will see the Blue Flame Ijen Crater usually finish at 05.30 AM. Finish Ijen Crater trip Package, Comeback to Paltuding (parking lot) for 2 hours then You can stop to stores to drink tea, coffee or You can have your breakfast. 05.20 AM, Enjoy Mount Bromo tour for Sunrise, and other views such as Mt Batok, Mt Kursi, Sea of Sand, Crater and Semeru Volcano (the highest volcano in East Java usually climb). If You want to take The Semeru volcano climbing, You can choose on April - November. 06.30 AM, Comeback to your jeep and continue to Mount Bromo Crater by stop at sea of sand (Jeep Parking) then start Mount Bromo Trekking for 30 minutes or using horse riding transportation. After finish enjoy the Sunrise, return to your jeep then comeback to your hotel to have breakfast, take shower and relax in your hotel enoughly. Wake you up for breakfast, take shower, relax enoughly, packing your luggage and check out from your hotel. If You have more time, You can enjoy Surabaya City Tour such as Surabaya Mall Shopping Centre, Souvenir Centre, Traditional foods, Batik or visit historical site for Sampoerna Cigarette Museum, Masjid Cheng Hoe and Greja Santa Maria. If You have not time to enjoy the Surabaya City, You just comeback to Surabaya Airport and Finish Ijen Crater, Mount Bromo, Madakaripura Waterfall tour 4 Days. This travel package only possible If You start from Surabaya or Malang in morning time around 08.00 - 10.00 AM. But If Your arrival in afternoon, You can change your itinerary into 3 days Mt Bromo, Madakaripura Waterfall, Ijen trekking. You can also start from Banyuwangi Harbor or Bali Island.